The main activities of higher education institutions (HEIs), teaching and research, have in recent years started to be influenced by EU law. For example, Austria and Belgium had to make changes in the past to their free and open access to higher education policies, the German study grant Bafög had been subject to various EU cases and a Dutch university’s spin-off activities have been scrutinised under state aid law. Yet, the EU has only limited competences in these policy areas. Indeed, the cases which partly required significant changes to national HEI policies did not arise from EU higher education or research policy, but from individuals relying on their rights in other, seemingly unrelated areas of law. What does this mean for HEIs in Europe? Will it pose a threat to the traditional European understanding of what a university is? Why is there not a coherent policy at EU level instead and would that be preferable? 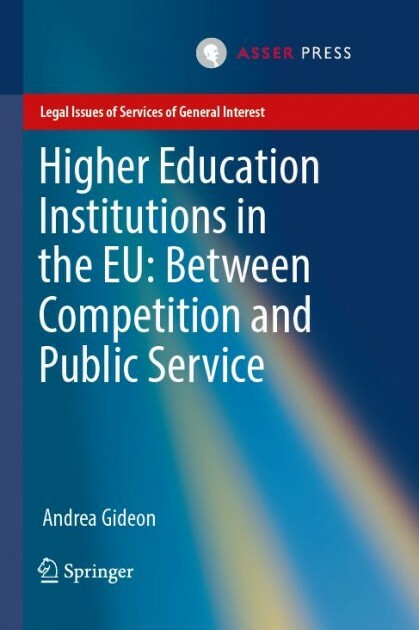 These are questions which are investigated in my forthcoming book ‘Higher Education Institutions in the EU: Between Competition and Public Service’ (TMC Asser / Springer, 2017). The book aims to provide a comprehensive assessment of the impact that EU law and policy have on HEIs in EU Member States with a particular focus on the impact of EU competition law on research in universities. While the impact of other areas of EU law has received some attention in the past, EU competition law is a largely unexplored area which made this a particularly interesting field for investigation. Furthermore, research on how EU law impacts on HEIs has thus far focused on higher education rather than on research activities of HEIs. In the book I try to redress this imbalance. On the following I will provide a short overview of the book. The first chapter, after setting out the research questions and structure of the book, investigates what the mission (in the sense of an idea or goal rather than a mission statement) of European HEIs is. In a short historical analysis it will be seen that traditionally European HEIs were research intensive, national universities with a high degree of academic freedom and autonomy which taught and conducted research for knowledge’s sake rather than towards a particular, commercially exploitable aim and were funded mainly by the state. However, more recently, they have become more economic in nature. Employing approaches from European integration theory, it will then be seen that this ‘commodification’ of HEIs can increase the likeliness that seemingly unrelated EU law can become applicable to HEIs/HEI policy. The law is then applied to cases by judges mainly when individuals attempt to rely on their rights arising from EU law. The ‘spill-over’ of EU law just happens in a piece meal approach rather than as a coherent policy. Furthermore, the application of economic law can lead to further commodification than may have been intended. The second chapter investigates the competences the EU actually has to draft policies on higher education and research. It will be seen that these competences are rather limited, especially in the area of higher education. Yet, the Member States (and other countries in Europe) seem to have felt it was desirable to coordinate policies beyond what would have been (allegedly) possible under the EU competences. They therefore opted for EU soft law mechanisms under the Open method of coordination as part of the Lisbon/ Europe 2020 Strategy as well as for the Bologna Process (which goes beyond the EU). However, as many have investigated these mechanisms are not entirely unproblematic. More, importantly, for our purposes, they do not prevent ‘spill-over’ from other provisions of EU law. Therefore, the second part of chapter 2 provides an overview of potential impacts of EU Citizenship law, the free movement provisions (free movement of goods, workers, services, establishment and capital) and competition and state aid law on HEIs in the EU. Chapter 3 continues in this vein by studying in more detail the area of EU competition law. EU competition law is only applicable to ‘undertakings’ and it provides an exemption for services of general economic interest (SGEIs). The two concepts are therefore, first, introduced and it is analysed in how far they apply to HEIs and thus in how far HEIs fall under EU competition law. It will be shown that this becomes increasing likely the more commercial elements an HEI system adopts. The second part of chapter 3 then conducts an in-depth legal-doctrinal analysis of potential constraints on HEIs arising from competition and state aid law. Here it is shown that competition law can occasionally help to vend of exploitative practices by HEIs (e.g. price fixing at a high level). However, it will also be shown that there can be a variety of situations where the application of the competition rules might have a detrimental social effect (e.g. when tuition fees are fixed at a low level to allow broader access and this is being challenged). Chapter 4 and 5 conduct an in-depth empirical study of potential competition law effects on research in universities in England, the Netherlands and Germany. These Member States have been chosen as they all started to experiment with more commercial elements in their HEI systems, but at a different pace with England being furthest on the path towards commodification, followed by the Netherlands and then Germany. Chapter 4 introduces the research systems of these three Member States and provides an initial competition law analysis. It will be seen that, if an activity does fall under competition law, potential tensions between competition law and national research policies may arise in all three systems. However, the more economically oriented the system, the more frequently this may happen. Chapter 5 then contains the empirical study itself. After setting out the methodology employed, a subchapter on each country discusses the economic constraints in the relevant systems, the awareness of key officers in universities of and the potential constraints arising from EU competition law. In all three countries interviewees expected the commodification tendencies to continue and there was some criticism for this development. Yet, the more detailed sentiments about the research systems as well as the awareness of competition law of the interviewees differed between the countries in correspondence with the general character of the research systems. On the basis of the information received from the interviewees, a more in depth appreciation than in chapter 4 of the question in how far competition law becomes applicable and in how far it may lead to potential tensions is then provided in chapter 5. While some potential tensions with competition law discussed in previous chapters do not seem to materialise in the three Member States, some could indeed cause concerns and others have been detected. Of course, there may still be the possibility of the application of exemptions, but these might not capture every situation and, in any case, might make the conduct of HEIs increasingly complicated from a legal/administrative perspective. Given the current situation, HEIs are thus advised to pay increasing attention to EU competition law. Chapter 6 connects the results of all chapters and contextualises them in the wider debate on commodification of HEIs and the concerns related to this development. In more recent Commission legislation it appears that the Commission has made some attempts to align EU research policy with competition and state aid. The chapter therefore discusses these attempts critically and concludes that this equally poses some concerns because they are partly overly complicated, are decided upon entirely by the Commission and do not appear to necessarily reflect the views of the general public or stakeholders in HEIs. Therefore, an outlook is given of potential alternative strategies, as unlikely as their realisation in the current Eurosceptic climate may be, for a more coherent EU level policy on HEIs which moves away from the current tendency towards commodification and truly clarifies the legal position of HEIs under EU law, though the details of such approaches will have to be left to future research. Andrea Gideon is a Postdoctoral Research Fellow at the Centre for Law & Business (National University of Singapore) for which she has suspended her position as Lecturer in Law at the University of Liverpool. In her current project she is investigating the application of competition law to public services in ASEAN. Her previous research concerned tensions between the economic and the social in the EU with a focus on EU competition law, in which research area she earned her PhD at the University of Leeds in 2014. C-147/03 Commission vs Austria, C-65/03 Commission vs Belgium. C-11-12/06 Morgan and Bucher, C-523-585/11 Prinz and Seeberger, C-220/12 Thiele and C-275/12 Elrick. For example, Dougan M, ‘Cross-border educational mobility and the exportation of student financial assistance’ (2008) 5 European Law Review 723, Garben S, EU Higher Education Law – The Bologna Process and Harmonization by Stealth (Kluwer 2011), Damjanovic D, ‘“Reserved areas” of the Member States and the ECJ: The case of higher education’ in Micklitz H-W and De Witte B (eds), The European Court of Justice and the Autonomy of the Member States (Intersentia 2012). Garben (n 4) questions if that was really as impossible as commonly held. For a shortened version see also Garben S, ‘The Bologna Process: From a European Law Perspective’ (2010) 16 ELJ 186. See, for example, Nóvoa A, ‘Ways of thinking about education in Europe’ in Nóvoa A and Lawn M (eds), Fabricating Europe – The formation of an education space (Kluwer 2002), Neave G and Maassen P, ‘The Bologna Process: an intergovernmental policy perspective’ in Maassen P and Olsen J (eds), University dynamics and European integration (Springer 2007), Garben (n 5), Corbett A, ‘Education and the Lisbon Strategy’ in Copeland P and Papadimitriou D (eds), The EU’s Lisbon Strategy: evaluating success, understanding failure (Palgrave MacMillan 2012). This entry was posted in Education, Law & Justice, Politics & Public Policy, Publications & Events, Science & Technology, The EU and tagged Bologna process, Europe 2020, higher education, research policy, universities. Bookmark the permalink.